Everyone loves coming home to a beer. 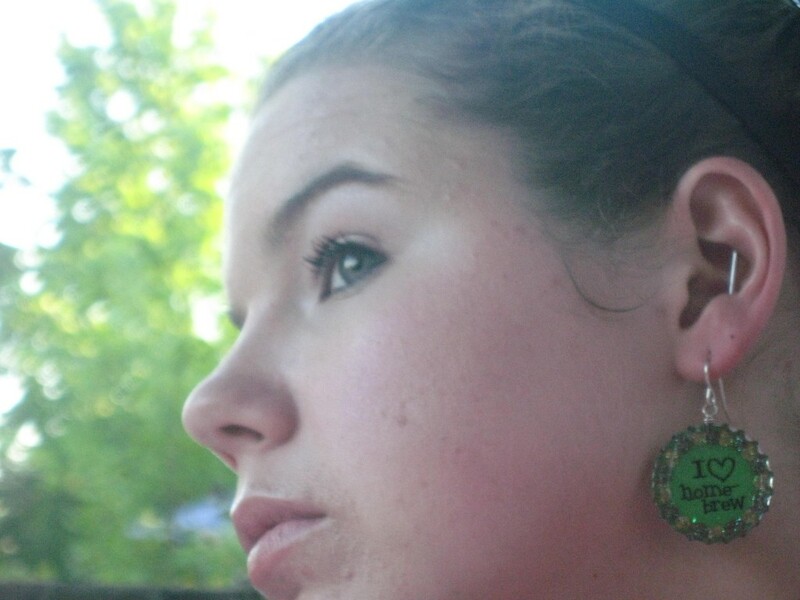 A few weeks ago, that happened to me. I got home from work, walked up my steps and there sitting on my doorstep was a four-pack of Uinta Free Form beers. I snapped a few photos, cracked open on, started reading the letter from Isaac Winter (Head Brewer at Uinta) and then texted my roommate, who’s gluten free. Over the course of a few nights, I finished off the four-pack and can honestly say that I really want to visit the least beer’d state (Utah) and check out this brewery. And for a gluten free beer, Free Form is pretty good. Definitely a hot summer day, drinking beer. Can’t wait to try the Blonde Ale next. 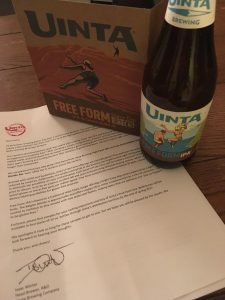 Salt Lake City – After an extensive research and development process that lasted nearly two years, Uinta Brewing Company has added two gluten-free offerings to its beer portfolio with Free Form IPA and Free Form Belgian-Style Blonde Ale. Brewed to appeal to all beer drinkers, but produced with naturally gluten-free ingredients, Free Form can be enjoyed worry-free and sacrifice-free by all gluten-conscious consumers, not just those with specific dietary restrictions. Brewed with millet and buckwheat, Uinta’s Free Form offerings are naturally gluten-free and have not been gluten-reduced by enzymes. Additionally, the brewery has implemented rigid testing procedures to eliminate the possibility of cross-contamination. Each batch of Free Form will be tested a minimum of two times prior to release: once by an external certified lab and once in house using Glutenox Detection, which can detect gluten as low as 5 parts per million (ppm). Free Form consistently measures below 10 ppm for gluten content, a level below that of current dietary labeling guidelines for gluten-free products. Uinta’s Free Form offerings showcase Uinta’s sense of adventure and commitment to carefully crafted beers for all consumers and occasions. Both brews will be available in four-packs of 12 oz. bottles through Uinta’s distribution territory by the end of spring 2017. Description: Citra and Ella hops impart a bright and tropical essence to this exceptional tasting, sessionable India Pale Ale. Description: Hints of coriander and Belgian yeast character partner perfectly with Sterling and Opal hops in this sessionable Blonde Ale. Uinta Brewing Company began its journey in 1993 with a passion for craft beer and a yearning for the great outdoors that aligned perfectly in Salt Lake City, Utah. Named after the only major east-west running mountain range located in the continental U.S., Uinta’s path is consistently led by the values of sustainability, community involvement and innovation. The brewery’s wide selection of high-quality beers is currently enjoyed in 38 states and three export markets. For more information visit UintaBrewing.com. Have you ever had Uinta Beer? What was your favorite? Been to the brewery? Had a good gluten free beer before? Leave a comment and share your experience! Heads up, Uinta provided me the beer and the awesome letter from Isaac Winter, the Head Brewer.